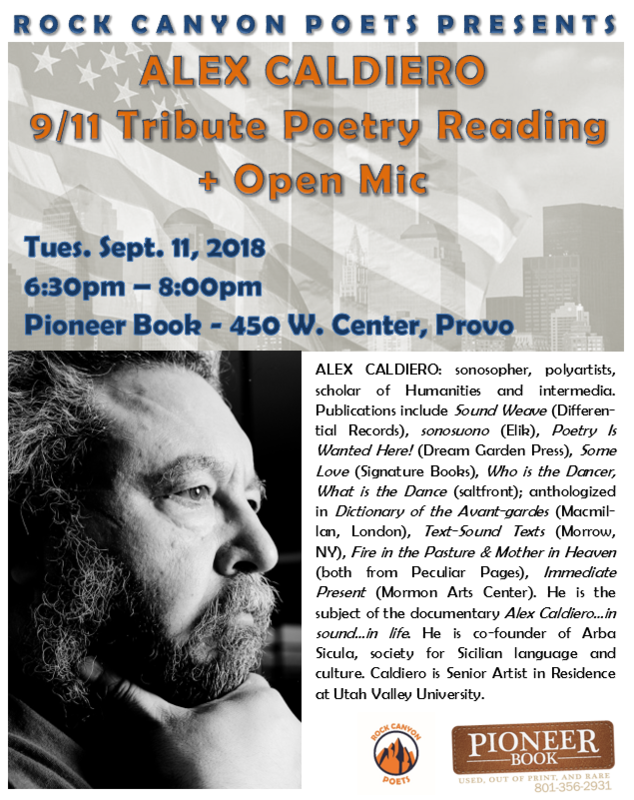 Rock Canyon Poets and Pioneer Book are please to present Utah poet Alex Caldiero for a special 9/11 tribute poetry reading. The event begins with an open mic at 6:30pm and runs until 8:00pm. Alex Caldiero: sonosopher, polyartists, scholar of Humanities and intermedia. Publications include Sound Weave (Differential Records), sonosuono (Elik), Poetry Is Wanted Here! (Dream Garden Press), Some Love (Signature Books), Who is the Dancer, What is the Dance (saltfront); anthologized in Dictionary of the Avant-gardes (Macmillan, London), Text-Sound Texts (Morrow, NY), Fire in the Pasture & Mother in Heaven (both from Peculiar Pages), Immediate Present (Mormon Arts Center). He is the subject of the documentary Alex Caldiero…in sound…in life. He is co-founder of Arba Sicula, society for Sicilian language and culture. Caldiero is Senior Artist in Residence at Utah Valley University. Caldiero recently performed at the Urban Lounge in Salt Lake City. Caldiero visits Pioneer Book as a guest of the Rock Canyon Poets and Pioneer Book. The reading and open mic are open to the general public.